If you are one of the 968 million people who log into Facebook each day, you may have noticed the platform offers three different ad placements, namely desktop newsfeed, mobile newsfeed, and desktop right column. Facebook also offers ads outside of Facebook through network sites (called audience network) as well as ads on Instagram. Naturally, advertisers would want to take advantage of all of the different ad placements but that does not mean they should all be in the same ad set. Generally speaking, campaigns can be run on all placements simultaneously except for the audience network which only runs if the mobile newsfeed is active. The behavior on site is different from one device to another. So, how people behave on the website may be different on desktop than what they would do if they were on a mobile device. Consequently, ad copies, landing pages, and of course the call to action as well as the overall advertising strategy should be adapted to the behavior per device. 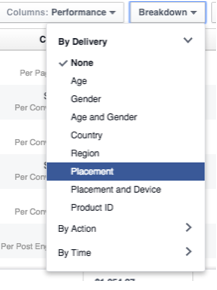 This means each of the available Facebook placements (desktop and mobile feed plus desktop right column) should always be in separate ad sets. Letâ€™s look at theÂ five most important advantages of breaking down placements in different ad sets and implementing a custom Facebook placement strategy. One of the biggest issues many businesses are having with Facebook ads is that they can be difficult to scale up quickly. By having each placement in a dedicated ad set, you can customize the budget for each placement based on performance. This is key to profitably scaling up accounts. For instance, letÂ´s imagine that you have a CPA goal of $10 and you have ad sets with multiple target placements (such asÂ Desktop newsfeed and Mobile newsfeed). If your current CPA is $11, running a placement report might reveal some placements perform above $10 and some below $10. Setting up separate budgets for each of the placements helps you get more for the placements below $10 and optimize the ones costing more than $10 with the goal to reduce the CPA. Whatever the goal of your Facebook campaign may beâ€”clicks, conversions, leads, engagement, you name it â€“ the most important thing isÂ visibility. Visibility is related to bids and there is no point in bidding the same thing for all placements because they are not equally expensive. Additionally, you might end up bidding too low for some of the highly competitive placements. In other words, always have separate bid strategies for the placements to get the most bang for your buck. Recently, when I was speaking at the SEJ Summit in Atlanta, someone asked why I recommend to customize ads per placement considering it takes a lot of time and there is a high chance people recognize the brand if the ad is identical. While I understand that brand recognition is important, I disagree with the fact that the identical ad will achieve brand recognition in the first place. Desktop and mobile newsfeed ads have completely different dimensions and desktop right column ads differ from both of those formats also. The point it, ads look different based on where theyÂ are shown. A perfectly readable ad on desktop may be too small to decipher on mobile. There is nothing wrong with using the same ad for all placements, but they should be adapted. For instance, mobile ads require less characters and need run on smaller screens than desktop newsfeed ads meaning the font size and small icons should usually be larger. By making anything larger one usually runs into Facebookâ€™s text/image ratio regulations. No more than 20% text still needs to be respected, even when things are made bigger for mobile devices. Make sure toÂ double-checkÂ Â Â Â Â Â Â Â Â Â Â Â Â Â Â Â Â Â if everything is readable or some characters are cut off on mobile. Landing pages tend to perform differently depending on what device the visitor is using. Having the same landing page for every placement simply means that you are ignoring the fact that people behave differently on different devices. Mobile users prefer short sales funnels, visual displays (such as a calendar for the expiration date of the credit card), and text that is informative but to the point. While many responsive websites are somewhat optimized for mobile, the checkout page is the one that typically causes the highest drop-off rates. The checkout page should be as short and easy to navigate as possible on mobile. On the other hand side, desktop users consider the length of the landing page and in-depth content when making a purchase. When optimizing for different devices, keep in mind where in the sales funnel the user is. For instance, people who found you via Facebook on a smartphone are typically further away from making a purchasing decision than people on a desktop device whoÂ opened a promotion via email. Breaking down placements in different ad sets allows you to focus your ongoing management strategies on the elements of the account that work best. Also, you are going to be able to create reportsÂ and eventually break the placement ad sets even further based on the device performance of age, gender, and geographical areas. All of that makes your ad strategy much more flexible and effective. 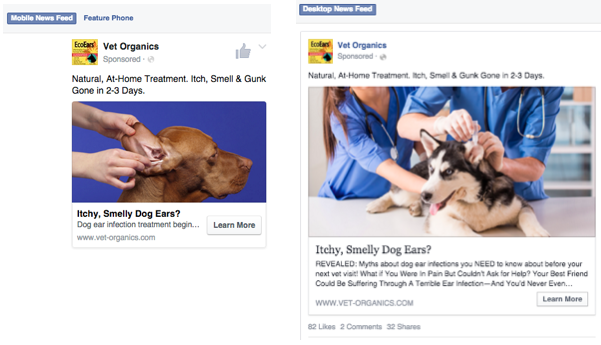 Custom Facebook placement strategiesÂ are a great way to maximize results. Thoughts or additional tips to add? Let me know in the comments! All screenshots by Rocco Baldassarre. Taken November 2015. How to Fix Pname Com Facebook Orca Error on Android?